A girls' weekend might include recreating or relaxing together, enjoying good food and libations, and a host of other activities that provide the backdrop for engagement and lasting memories. XCSkiResorts.com has found a list of women's programs for this winter ranging from once-a-week group outings to week-long all inclusive packages. Go Red for Women's Heart Disease program at Great Glen Trails Outdoor Center in Gorham, NH on Friday, Feb 1, 2019 with 50% discount on trail passes and rental equipment to those wearing red. Also Women's Winter Escape is on Jan 19-20, 2019 from 8:30 - 4:30 for an all-women’s weekend with classic and skate ski clinics, naturalist-led snowshoe tours, yoga, equipment demo, snow tubing, and more. Lutsen Resort, MN on the north shore of Lake Superior in MN has its Girlfriend Getaway Package, which includes a bottle of champagne, massage or treatment, breakfast, dinner, a spa treatment, guided tour with complimentary XC ski or snowshoe gear (or hiking, biking, or sea kayaking in the warmer months) and galleries and shopping in nearby Grand Marais. Want a guilt-free way to indulge yourself with food while exercising? Cross country (XC) skiing and snowshoeing are some of the best forms of aerobic exercise, but if you go on a "Gourmet Ski Tour" on your XC skis or snowshoes, you may very well eat your way to fitness at a number of trailside food stops. What a grand time so go ahead, eat, ski, and be merry - appetizers, wine, champagne, fondue, entrees, desserts, and more. Here's a cross section of the culinary XC ski events that are planned this winter across the country with a varied menu of fun and fine cuisine. Smugglers Notch in VT has the S'mores and Snowshoe Trek every Wednesday night 5:30-7:00 PM. S'Mores await snowshoers after a short trek to a bonfire. For hardier snowshoers there's the Notch Night Snowshoe Tour on Tuesday night, and on Wednesday nights there's a Snowshoe Adventure Dinner at the mountain summit. The Maple Experience is on Tuesdays on a tour to learn about maple sugaring and get to take home a sample. Look for the Morse Highlands Day Lodge for a bonfire and S'mores. Notchview Reservation in Windsor, MA hosts the Moonlight Ski, Wine & Cheese event on XC skis or snowshoes for tasting of local wines, beers, and cheeses. Go by your own headlight or the moonlight. Pre registration required for event on Jan 19, Feb 16, and Mar 16 starting at 6:15 PM. The Chocolate Festival at Mt. Washington Valley Ski & Snowshoe Center in Intervale, NH on Sunday, February 24 is an inn-to-inn affair at 10-12 stops to experience your chocolate fantasies including moose and fondue. Go on a tour of any length and actually gain calories, even if you ski as far as 20 kilometers. A shuttle is also available for those that have overindulged at the event dubbed the "Sweetest Day on the Trails." Treetops Resort in Gaylord, MI has the Skiable Feast Getaway Package that features a winter gourmet adventure with 5 buffet food stations along 6 km of trails. It is offered on 7 dates on Saturdays during January-March. On Feb 2, Cross Country Ski Headquarters in Roscommon, MI the "Ski the Beer Trail" is a new event with XC skiing, craft beer tasting, and a rustic BBQ lunch along the trails. Look for the Fill at the Grill and Fire on the Mountain food events. The Upper Peninsula of Michigan in Ironwood features cuisine from local restaurants that can be purchased at a nominal fee along a designated route along the trails at the Taste of the Trails on the ABR trails on March 9. Look to the Galena Lodge in Ketchum, ID for the Full Moon Dinners on nights with the full moon, whereby you can go ski or snowshoe ($5 snowshoe rental offered) and then return to lodge for a 4-course dinner at $40 or half price for kids under 12. There are also special Wine Dinners, Holiday Dinners, Valentine's Day Dinner and Twilight Ski Dinners scheduled from mid-December to mid-March. At Devil's Thumb Ranch Resort & Spa in Tabernash, CO, the Ski, Sip & Spa is an all day event that includes lunch and wine & cheese. It is set for Feb 10. Also, the Taste of the Ranch dining series regularly features fresh offerings for a 4-course ranch-to-table experience. The Rendezvous Trails in West Yellowstone, MT features cuisine that is homemade and from local restaurants that can be found along a designated route on the trails at the Taste of the Trails on Feb 17. Pay in advance at West Yellowstone retailer Free Heel & Wheel. 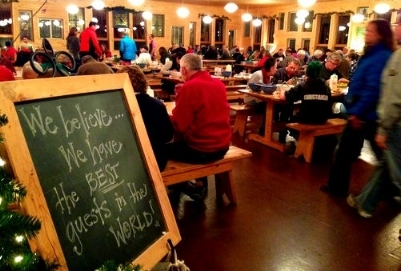 Frisco Nordic Center in CO has the Ski, Eat and Be Merry event on Feb 9 from 6:00 - 10:00 PM with a progressive dinner along the trails featuring food, drink, 3 bonfires and 300 luminaries on a 2 km loop. The evening ends with a party in the lodge. Frisco is also hosting a Snowshoe Dinner on two Sundays, Jan 20 and Feb 17 starting at 5:00 PM for a tour and then dinner. Tahoe XC in Tahoe City, CA has the New Year's Day On Trail Pancake Breakfast at 10-11:30 AM with skiing or snowshoeing to the unique trailside "lunch truck" (pictured above) for a hot meal made to order right along the trail and remember to sign up in advance. Fish Taco Night is a fundraiser on Feb 13. Cypress Mountain outside of Vancouver, BC has Fondue Dinner Snowshoe Tour, Girls' Night Tours, and Music Night all scheduled to start in January. These programs include rental equipment, trail access, and guides/instructors. Fat bikes, dubbed the "Hummers of the two-wheelers' world" in the Wall Street Journal are proliferating where there are more than 150 cross country (XC) ski areas that have fat bikes available to use on snow covered trails. These specially-made bicycles that accommodate ultra-wide tires that can be run at very low pressure 4-8 pounds of pressure allow fat bikes to roll over soft, slippery surfaces like snow. XC ski areas and regional pockets across the nation in Vermont, Michigan, Wisconsin, Minnesota, Alaska and Washington now have fat bike trails with groomed single track and signed trails, rental bikes, and special events. An industry source (at QBP, the manufacturers of fat bike brands Surleybikes, Salsacycles, tires, boots, gloves, and apparel) recently reported that 150,000-200,000 fat bikes have been sold since 2010 while there are about 7 million mountain bikes sold. Fat bikes provide a great way for avid cyclists to stay in shape during the winter season and they provide different recreational fun for people who are active or love the outdoors. Fat bikers are mostly male and are aged 35-65, with 80% at high education levels Bachelors degree or higher) and professional/managerial vocations. The Kingdom Trails in northeastern Vermont is the foremost mountain bike destination in the east with more than 40,000 day passes sold in 2017 (20% increase from the previous year) and they've quickly parlayed this notoriety into becoming a mecca for fat bikers in the winter. Kingdom Trails has 100 miles of bike trails (30 of which are used in winter for XC skiing, snowshoeing and fat biking) and works with 80 different land owners. They also host Winterbike, which is the biggest fat bike festival in the east. At Darling Hill Road in Lyndonville, the Village Sport Shop has a trailside facility adjacent to the Kingdom Trails Nordic Adventure Center renting fat bikes for $55 a day and sells the bikes ranging from $1,800 to $2,800. Fat bike products include softgoods, accessories and bikes available from companies such as Liv Bikes and Pivot among others. Kingdom Trails has three paid groomers who maintain about 30 miles of trails. Day membership prices (day pass for trail access) are $15 a day for those aged 16-69 and $7 for youth aged 8-15. There are also year-round memberships available with an annual family membership priced at $150. The Kingdom Trails Welcome Center is in East Burke and the Kingdom Trails Nordic Adventure Center is on Darling Hill Road in Lyndonville. At the Nordic Village outside of Flagstaff, AZ there are 25 km of snowshoe trails that accommodate fat bikes. The bikes ride much better on packed trails compared to riding on soft snow. Fat bikes can be rented at Flagstaff Nordic for $35 on weekends plus a $10 trail fee, and they offer a 40% discount on weekdays ($20) while charging a lower trail fee on weekdays ($7), too. In eastern Washington's Methow Trails the winter season can be longer than all other seasons combined and it was one of the first trail networks to embrace fat biking. They saw it as a new, exciting way to get outside and recreate and for the passionate XC skier interested in fitness, it provides another way to cross-train. Some guys from Methow Cycle & Sport groom some of the local trails and the shop rents 16 fat bikes. One avid snow biker describes the thrill of riding his fat bike in the winter as, "Riding on snow has been a great alternative to my other winter love…Nordic skiing. Hopping on the snow bike has been a great way to mix up the winter activities. There's an amazing sensation when you climb aboard a snow bike and find that you "can" ride where only skiers or snowmobilers had once been able to go!" Surveys show that 71% of fat bikes were introduced to the sport at a demo, borrow, or rent the bike that they are riding and 64% of the fat bikers said they would pay to ride on groomed trails. Fat bike trail offerings are assessed on a day-by-day, snow conditions, user compatibility basis. Information on the trails that are open to fat bikes is available daily on the Methow Trails grooming report. Just like a skier, a valid Methow Trails day pass will be required for snow bikes. Fat bikes are available for rent ranging from $15 per hour at Rikert Nordic Center in Ripton, VT to $55 for a full day reaching $75 a day at New World Sport, a Fort Collins, CO, shop that sends riders to local packed snowshoe and XC ski trails. Methow Cycle and Sport in Winthrop, WA has a $35 half day rate or $55 for a full day. Reservations are recommended for weekends and holidays. Methow Cycle and Sport will also provide rack adapters for customers who wish to transport rental fat bikes to the riding area of their choice. Other XC ski areas that have fat bikes on location to rent include Woodstock Inn & Resort in VT, Great Glen Trails in Gorham, NH, Cross Country Ski Headquarters in Roscommon, MI, in California at Bear Valley Cross Country & Adventure and Mont-Sainte-Anne, QE. As one might imagine the price for purchasing a fat bike ranges greatly from a low-end of $200 (at Walmart) to $1,800-6,000. Like any other equipment the low end is probably less reliable and the high-end includes bells and whistles or are built with carbon fiber construction. * Riders need to purchase a trail pass to use the area's trails and tell the ticket vendor that they are planning on fat biking. * Trail access is dependent on conditions and they should check the daily grooming report for detailed trail access information. * Bikes should yield to all other users. Stay to right side of trail at all times, stay out of the classic ski tracks, and give skate skiers a wide berth. * Stay off trails with more than 3" of new snow. * If you are leaving a rut deeper than an inch, having a hard time riding in a straight line, or pushing your bike, the snow is too soft and you absolutely should not be biking on the trails. * Be an ambassador for the sport – stay polite, educate other bikers, discourage bad behavior, follow the rules, and we'll all have a good time this winter. * Stay on trails designated for Fat Biking. Create family memories on a cross country ski weekend. Resorts run by families, are great for family winter vacations packed with something for every family member from fresh home cooked food to the atmosphere and fond memories. These family-run resorts offer family clientele a combination of togetherness and/or solo time. There’s never a concern about nothing to do because there are so many choices. From reading a book to hiking, horseback riding, swimming and kayaking in the summer to sledding, cross country skiing, snowshoeing, ice skating and other nearby snowsports in the winter. Many of these recreational activities are perfect for family bonding and they create joint memories to last a lifetime. Some folks like to simply unplug and enjoy being away from the hurried world of jobs, schedules, and commitments. Many families opt for their vacation time to become untethered from modern-day trappings such as smart phones and social media, for a heightened state of relaxation to enjoy a quieter, easier world. Emily Christie of Falcon Trails Resort in Falcon Lake, Manitoba said “We are a family run resort and it is a huge part of the identity and spirit of our business. Falcon Trails was founded by my parents Barb and Craig, who have been carpenters in the area since 1980. They have a love of skiing and were very active members of the local Nordic ski club. When the government decided to close the local ski area, my parents came up with a proposal to build rental cabins to provide a financial crutch that would help keep the ski hill alive. So for the last 20 years our family has owned and operated the local ski slopes/Nordic trails, which is now a four season cabin rental resort. Today my two sisters and I, along with their partners, run the resort together. Anne Carter, owner of Carter's Cross Country Ski Centers in Bethel and Oxford, ME has two daughters and sons-in-law that help with the operation of the two centers. “They’ve been playing at the ski areas since they were one and half years old and then helped out since they were in middle school with the operation in the shop, grooming, and giving lessons.” Of course, the kids’ friends were attracted to the ski areas and the customers got to watch the girls grow up and then see the grandkids around the centers. Jay Richards, the second generation manager of Maplelag Resort in Callaway, MN lives with his wife and kids at the resort, which continues to be the home of his parents so it’s truly a large family with three generations involved. Maplelag prepares plentiful, homecooked meals and family members gather in the dining area to mingle with other guests from other families. The family-style meals served at elongated tables are known to feed the camaraderie and family magic that can be had at the resort. Whether skiing or not, people rave about their time spent at Maplelag. The lodge is a treasury of Norwegian Folk Art with nooks and crannies to enjoy together or get away to relax and read a book. A Variety/Talent Show is organized each week and it’s a big hit for families whose performances feature everything from jugglers and family skits, to jokes, musical instruments and German beer drinking songs. The show is followed by the Saturday Night Dance, which offers an eclectic collection of music for dancers of all ages. The Richards pride themselves on making everyone who comes to Maplelag feel like they are part of the "Maplelag" family. They feel very connected to their guests and many have been coming for over 30 years. The bottomless cookie jar philosophy at Maplelag is a great example of how having access to cookies at any time at no charge creates a feeling of being "at grandma's house" instead of feeling like the corporation is doing everything to maximize profits. Owner Jay Richards commented, “It is important that guests don't ever experience feeling unwelcome at Maplelag. The word hospital stems from hospitality – and Maplelag is an operation that wants people to feel better physically, emotionally, and mentally after they have visited Maplelag. If the experience is enriching, then people will hopefully come back for more "Maplelag therapy"...and all of our families could use a little "fun" therapy. Killington starts to make snow when the grass is still green! As the days become colder and winter approaches, the ski season beckons but about 40 cross country (XC) ski areas are no longer waiting for the snow to fly to begin their ski season because they’ve invested in snowmaking, just like their alpine ski area cousins. More and more XC ski areas are investing in snowmaking. Trapp Family Lodge steeped in tradition in Stowe, VT is included in this ever increasing list of XC ski resort snowmakers. The list of XC ski area operators that produce machine-made snow includes for example, Rikert Nordic Center, Craftsbury Outdoor Center, Sleepy Hollow Inn, and Mountain Top Resort, in VT; Adventure Center at Waterville Valley, Bretton Woods Nordic Center, Great Glen Trails and Gunstock Mountain in NH, and Pineland Farms in ME; Weston Ski Track in MA; the Olympic Sports Complex in Lake Placid, NY; Cross Country Ski Headquarters in MI; Breckenridge Nordic Center and Frisco Nordic Center in CO.
Why did these XC ski areas decide to invest in a snowmaking operation? The availability of less expensive and portable snowmaking systems are main motivations, but other business-driven issues are relevant too such as filling lodge rooms and fulfilling season pass holders' desire to extend the ski season beyond Mother Nature's whim. Twenty years ago, one industry consultant dubbed the XC ski resort quandary as "precipitation roulette." Some business-oriented reasons to install snowmaking include operational security to guarantee skiing programs and staffing; competitive advantage against other XC ski resorts that do not have machine-made snow; and guaranteeing snow cover in important holiday periods (which can represent more than 30 percent of annual winter business). The necessary elements of a snowmaking operation include cold temperatures, water, power, and system components such as piping, pumps, compressors, and snow guns. The power requires both manpower and energy supplied by electricity or fuel. There are many industry horror stories about the night hours and difficulty of the work associated with snowmaking for XC skiing. Getting the snow to efficiently cover a narrow corridor trail is also a challenge. Many operations simply cover a field and then move the snow to the trails. Most commendable is Sleepy Hollow Inn's system in Huntington, VT, which is powered by solar energy. Rikert Nordic Center increased from an average of 70 days of operation before snowmaking was added to 140 days without inseason closures! The Adventure Center at Waterville Valley makes snow to cover its town square area and a beginner's loop in a field. 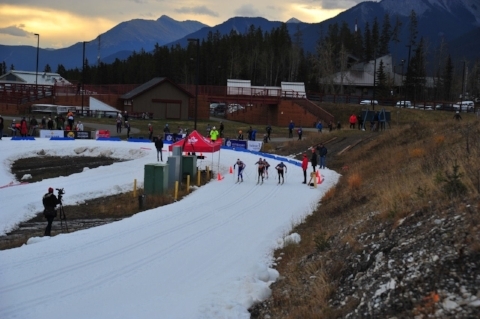 Snowmakers used machine-made snow to cover trails at Canmore Nordic Centre and the Olympic Sports Complex to run early season programs for racing teams from across North America. But the most significant issue to embark on snowmaking has always been the investment required for many XC ski businesses that are small and seasonal. The operators at Mountain Top Resort in Chittenden, VT decided that snowmaking was a higher priority than selling retail products at the XC ski center. Snowmaking supports so many aspects of the business from rental operations and ski lessons to dog sledding and snowshoeing. In terms of the guest perspective, winter guests expect to book travel to a destination and get the experience that was desired…and that includes snow! Who knows, perhaps there will be a day sometime soon when snowmaking will be a basic aspect of XC ski area operations. Upper photo Killington snowmaking; Middle photo XC ski racing in October at Canmore Nordic Centre; Lower photo Snowmaking at Rikert Nordic Center. Tahoe Donner Cross Country Center in Truckee, CA had a fantastic winter season overall, including excellent snow conditions over Christmas and New Year’s. January alone was a record-breaking month for snowfall. The base area at Tahoe Donner Cross Country received 530” of snow this winter, which is significantly above the average of 450” per winter season. People were visiting just to see what the buzz was about. The season pass and day ticket sales were exceptionally high. They saw a lot of new folks taking lessons or trying XC skiing, taking advantage of the great conditions and they reported that fat biking has taken off in the past couple of years. Methow Trails in eastern WA was open 115 days with the season ending on April 2. They groomed over 16,000 miles and were up 10% in revenue for the season with the best ever season pass sales. The Methow community keeps growing in winter visitation with skiers primarily coming from the Seattle area. They’re 4 hours away from Seattle but Seattleites enjoy going to the Methow for snow and sunshine! There’s also good visitation from Canada as they offer Canadians the prices on par. Methow Trails is still very enthusiastic for the fat bike trend as they saw an increase in people trying fat biking this season. At the Sun Mountain Lodge in Winthrop, WA retiring ski operator Don Portman reported they had a great winter season, which was cold with lots of great hard wax classic skiing. The groomers were thrilled since it was mostly easy snow to groom and no grinding ice. The Christmas holiday period was strong and business was good. The rental equipment and lesson numbers were down slightly over last year, which was the best year ever. Fat biking continued to grow in the valley and there has been an expansion of fat bike trails away from the ski trails at a local state park. The lodge is also seeing growth in snowshoeing and even though the snowshoe rental fleet was increased this past season, they still almost ran out on a couple of busy weekends. There are some spectacular snowshoe trails and people were very happy using them. There was also an increased use and interest in skin based off track skis such as Altai Hoks (brand model of short wide waxless skis that are like snowshoes), and the new waxless track skis with attached skins. The past XC ski season at Devil’s Thumb Ranch (DTR) in Tabernash, CO started the day before Thanksgiving and finished on April 9th with four and a half months of great snow. The Stagecoach Classic, which is a point-to-point race attracted 450 racers from across the country and one of the season’s highlights was the Women's Ski and Spa in February attracting about 110 women, which gathered great reviews from the participants. At Sun Valley Nordic Center, they topped the previous season with 112 days of operation. About a quarter of the visits were by snowshoers and 95% of the ski lessons were private. Nordic Director Ivana Radlova commented, “The snow seemed to be coming every day after the first appearance and the mountains of snow made for some great skiing, but also brought some challenges with grooming and visibility. There was a noticeable lack of sunshine this winter in Sun Valley and there were more people Nordic skiing or snowshoeing who would be ordinarily alpine skiing who came largely due to the weather – flat light, snow storms. One day the mountain had to close all together and the Nordic trails had a whole bunch of folks with helmets and goggles showing up for some skinny skiing.” There was some interest in fat biking at Sun Valley Nordic, but conditions were rarely perfect for them as the ski trails were often soft and the bikes would leave deep ruts, which annoyed the skiers. Mariah Frye of Cross Country Ski Headquarters in Roscommon, MI reported that December snow set the stage for a successful season, which was a bit above the annual average. She saw more new faces at the area such as retired baby boomers and people who exercise attributing to the US Ski Team success in cross country skiing and attractive rates at the area. The season pass is only $38.00 at Cross Country Ski Headquarters and they did great with rentals and selling retail ski packages. Trends at the area include the popularity of skin technology on ski bases and events that engage more people combining cross country skiing and snowshoeing with yoga, live music, and food events. At Lapland Lake in NY, “Snowfall was 104” compared to an average of 116” and total ski days were 110 compared to an average of 109. The weather challenged us repeatedly with unusually warm and rainy conditions. Snow patterns in nearby metro areas, which help motivate our customers to turn out and ski, were not great. “Snow came in early December giving people the lead time and confidence to plan visits over the Christmas/New Year’s holiday and we had a great holiday season. Overall winter weather was a bit on the warm side and conditions became a bit challenging as we moved into March and during those weeks we chose to focus on quality over quantity closing parts of our trail system. Then the 20-inch storm on March 14th brought us back to almost 100% operation and gave us outstanding conditions until our last day of operation on April 3rd. Compared to 2015-16 we saw a dramatic improvement in ski lessons and ski equipment sales. Ski lesson volume more than doubled from the previous year. This tells us that new people continue to discover the sport, and that experienced skiers are committed to continuing and often expanding their personal range of XC ski activities. In the Lake Placid, NY area reports from the Olympic Sports Complex showed an incredible increase of skier days that was 30% above the average year and a great increase in revenue per skier while being open for 139 operational days. They’ve categorized experiences for guests with a “Discover” program for cross country skiing and biathlon, guided tours for activities at Josie’s Cabin a short distance destination along the trails, weekly baby boomer camaraderie programs, and invigorating ski clubs in nearby towns. The Complex is a former Olympic site with a stadium and it is now experimenting with the Snow Factory that can produce machine-made snow at temperatures up to 60 degrees. They plan is to start making snow next September so a ski loop can be open in October for team training programs. In the southeast region at Whitegrass in WV there was record breaking interest and participation in their Winter Discovery snowshoe walks that touched on different natural history subjects. Long time XC ski guru Chip Chase said, “We experienced one of our busiest ski days ever in early February when all the perfect conditions converged and one of the busiest Sundays ever in March when loyal customers flooded the trails in order to support our efforts. Season passers, mostly from out of town, were stronger than ever as skiers are more than willing to support us. Our rental and sales fleet have never been better, trails and grooming the best it’s ever been, and basically all we need is SNOW! We lost every holiday to rain or no snow except New Year’s Day, yet a few other busy weekends took us over the top to make it financially.” Some of the biggest trends at Whitegrass include wider skis and more interest in backcountry skiing, and a younger crowd. While much of the success is related to getting snow, the ski areas are developing programs and efforts to take advantage of winter to make it happen and withstand the ups and downs of the climate. Where are the XC Skiers in the Spring? As the cross country (XC) ski season winds down most XC ski areas close because of lack of skiers rather than lack of snow on the trails. The sun comes out, the temperature rises, and the XC skiers quit. Why? Are we infected with winter fatigue? Is the lure of spring time recreation too strong to ignore? XCSkiResorts.com spoke with some ski area operators around the nation to get their take on spring skiing. Many areas host springtime season pass holder parties and offer big discounts for purchasers of season passes for next year. Lapland Lake in Northville, NY commented that their trails are compacted on a daily basis so the snow does not disappear like in the city or open areas in suburbia. Lapland's Kathy Zahray encourages skiers and snowshoers to get out and enjoy this weather and these great spring conditions!" Zahray admits that “the reality is that in the spring it costs more for grooming and staffing than the amount of income earned from the diminishing number of skiing patrons, however this is one of the most fun times of the year to enjoy the outdoors. The milder temperatures and discounted rates are terrific for everyone and it is fun to ski in shorts and t-shirts." Lapland Lake is offering special lodging prices through the end of March starting at $150 per night for two guest and 15% discount for 3 nights or more. Carters XC Ski Centers in Bethel and Orford, ME have been very busy this spring renting cabins and selling equipment. Carter’s hosted the Burger, Beer & Bike Festival for their patrons to try fat bikes and enjoy the area. In Minnesota at Maplelag Resort, proprietor Jay Richards concurs "that people want to get on the snow early but get tired of winter and ready for warm spring days." He feels that "skiers in the Midwest are conditioned to colder and drier snow compared to skiers in other regions who are more accustomed to a wider variety of snow conditions." At Cross Country Ski Headquarters in Roscommon, MI they run spring events on machine-made snow such as the Hawaiian Barbecue where they have locally raised pork hocks, along with island style veggies and of course fresh grilled pineapple. Proprietor Lynne Frye invites everyone to celebrate all that is great about spring: long, sunny days of great cross country skiing in Michigan! Kristen Smith at Methow Trails in Winthrop, WA stated, “This season has been another fantastic snow year! We have no shortage of snow but people stop skiing in late March which is really too bad because we often find the best skiing of the season comes in the spring. The trails are well packed, and the days are lighter and warmer making it much more comfortable to ski. We’re seeing that in the Methow right now and I just had one of my best days on snow all year!" Kids on cross country skis or snowshoes? It is not only about child obesity, nature deficit disorder, and better brain function – it's about fun. What can the kids do after school or on the weekends? Have you set your plans for the school breaks this coming winter? The winter can be snowy yet mild and great for a weekly program or a family winter vacation with plenty of cross-country (xc) skiing and snowshoeing, so gather up the kids and head to the hills. There are xc ski resorts that are exceedingly kid-friendly with fun activities to enjoy on the snow. And xc skiing and snowshoeing not only delivers great times for kids, they create memories they'll have for a lifetime. Smuggler's Notch Resort in VT is known for family programming. The one and a half hour XC ski lesson for kids happens in a special terrain park that has snowy roller bumps and other features for kids to learn balance and increase confidence while having fun on skis. Snowshoe programs at Smuggler's include the Cider Walk and the Sugar on Snow Trek. Jackson Ski Touring nestled in the Jackson Village in the NH's White Mountains has a free, supervised 90-minute ski tour of their wooded trails every Sunday through March 5, 2017 (except Feb. 19). The tours are led by a youth program director in the local school district and her husband, who is a ski patroller and Wilderness First Responder. The Youth Nordic Program tours are open to kids ages 11-17 who are at least intermediate to advanced level XC skiers. The program is 10 AM- Noon, on wooded excursions with a maximum group of 10 focusing on fun, with stops along the way to watch birdlife, study animal tracks, and ice crystals in the streams. The Snow School program has snowshoeing for about 30,000 kids annually in more than 60 locations in 16 states across the nation. Some of these programs include games, ecology, wildlife tracking, outdoor skills and more. Go to the Winter Wildlands Web site or Facebook page for a list of Snow School locations. At Cross Country Ski Headquarters in Roscommon, MI the Junior Muffin Races are held on March 19, 2017 for kids in three age groups (6 and under, 7-9, and 10-12) with free registration, trophies for all participants, and lunch included. The short race distances are age appropriate for each group. Breckenridge Nordic Center in CO has one of the best equipment exchange programs for kids whereby kids can trade in their old equipment for similar or upgraded equipment or gear in a different category. Methow Trails in Winthrop, WA has three StorySki trails that feature 1 km loops with illustrated story book pages on large panels displayed along select trails for kids to read as they ski or snowshoe. There are also two interactive “Wildside” signs for older kids along the trails. And there are no trail fees for kids under the age of 17! Tahoe Donner Cross Country Center in Truckee, CA has three kids programs between January and March for different age groups. An 8-week After School program is for kindergarten-grade 5. Third to fifth graders have a Junior Racer program while second to eighth graders can learn how to race and shoot a rifle in the Junior Biathlon program. A number of states conduct statewide programs to encourage kids to get outdoors in the winter. The Ski New Hampshire "4th and 5th Grade Passport" offers trail passes for one visit at the state's XC ski resorts. The Michigan Snowsports Industries has the "Cold is Cool Passport," which requires that an adult paying full price must accompany the kids and there is a $15 cost associated with the passport for XC skiing. The WinterKids organization in Maine also has a variety of programs for thousands of kids each winter. Lapland Lake in Northville, NY has the Reindeer Rally season-long program for kids supervised by skilled, kid-friendly, incredibly entertaining PSIA-certified instructors. The program, which is for kids aged 5 – 11 runs 90 minutes on weekends and holiday weeks. The "on-ski" games include Toilet Bowl Tag, Limbo, Spider (flag tag), Soccer on Snow, Relay Slalom, Caterpillar Relay, Sharks & Minnows, Scavenger Hunt, Elephant Hunt & more! Great Glen Outdoor Trails Center in Gorham, NH has the Kids Ski Fest on Sunday, Feb 19 with games on the snow, relays and a themed ski tour. The Trail Tracker program is free everyday scavenger hunt at Great Glen, which is a big hit for kids to track down cartoon animals out on the trails. When they find the animated creatures, they stamp a card and upon return to the lodge they get a treat. These winter programs feature ways for kids to learn balance and increase confidence while having fun on skis or snowshoes. And they're committed to helping kids develop lifelong habits of health, education, and physical fitness through participation in outdoor winter activities…and as the kids can attest they are also just plain fun. 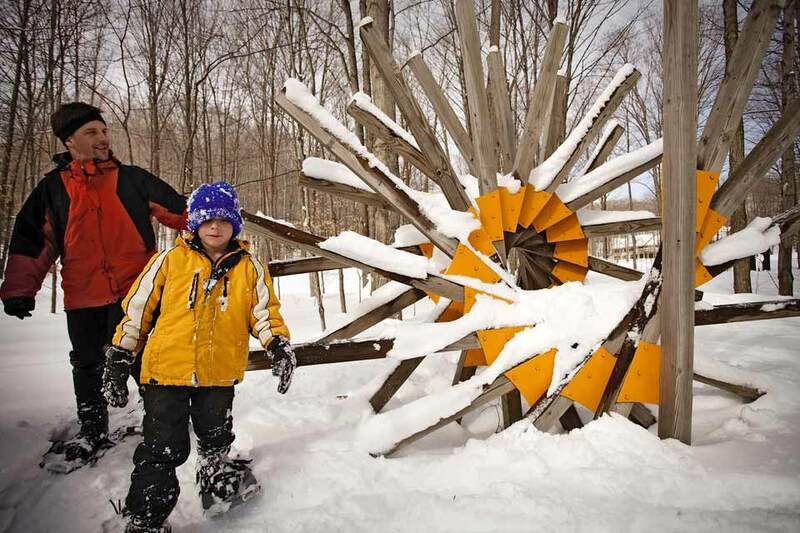 Photos: Lapland Lake Vacation Center; Snowshoe Dad & Kids by Smuggler's Notch Resort. Plan to gather up the kids and head to the hills during the school breaks next winter. No need to head to warmer climes - winter can be snowy, yet mild, and perfect for a family vacation with plenty of activities such as cross-country (XC) skiing and snowshoeing. According to the experts, who regularly update XCSkiResorts.com, the nation's top XC ski resorts are exceedingly family-friendly with lots to enjoy together both on the snow and off. What families want and need is exactly what an xc ski vacation delivers: multi-generational participation, quality time and shared memories. Lapland Lake Ski & Vacation Center in Northville, NY has nightly bonfires on the weekends and the kids love to play Napa Kikku, which is a Finnish game on ice with a sled and a pole. Kicksleds, tubing, ice skating and parents use pulk sleds to pull the kids along the xc ski trails. Pineland Farms in New Gloucester, ME has family programs to engage kids and adults with outdoors and educational activities such as XC skiing, mountain biking, equestrian, exploring life and animals on the farm, apple cider making, butter making, milking a cow, carving pumpkins, and much more. Trapp Family Lodge in Stowe, VT is one of the most famous family resorts where the hills come alive with the "Sound of Music." In the Green Mountains of Vermont, Trapp Family Lodge is a paradise for families with a fitness center, an indoor pool and the Mountain Kids Club provides playtime, craft time and movies for kids. Smuggler's Notch Resort in Smuggler's Notch, VT has a dynamic lineup of family programs with 1,000 acres for alpine skiers and snowboarders, teen centers, kids camps and FunZone play area, resort village with shops and restaurants, condo lodging, and walk-to free shuttles. There's xc ski and snowshoe trails, winter walking, ice skating, and more. Recognition for family focus has been awarded by numerous magazines. Maplelag Resort in Callaway, Minnesota is run by a 3-generation extended family and this resort has families coming back year after year. They serve family style meals and host a talent/variety show, which is a big hit for families. The state’s largest hot tub, famous bottomless cookie jars, sledding, ice skating, and XC ski/snowshoe trails combine to make this one of the most popular family destinations. 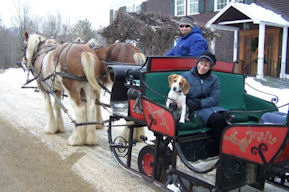 As the name implies, Palmquist Farm in Brantwood, WI is an XC ski center on a farm that offers kid-friendly animals such as horses and a dog. There are sleds to use on sliding hills and ice skating pond, plus horse-drawn sleigh rides and kids rental ski equipment. They say that a visit to Palmquist's is like coming home to Grandma's house. Devil's Thumb Ranch Resort & Spa in Tabernash, CO has outdoor adventures from XC skiing and snowshoeing to Zipline, horseback riding and laser biathlon. There are "cowpoke camps" for overnight guests with kids in half and full day programs, heated pool, movie nights, game room, and more. Lone Mountain Ranch in Big Sky, MT has programs for outdoor youth adventures that include animal tracking, snowshoeing, tubing, snow kickball, obstacle Olympics, finger painting, scavenger hunts and ice cream socials. Parents will love the cuisine, massage and xc skiing on picturesque trails. You'll be amazed by the giant trees in Sequoia National Park and Monument near the Montecito-Sequoia Lodge in Kings Canyon National Park, CA. There is a daylong program for children, which has a break for the family to join together during lunch. The kids build igloos, go tubing and XC skiing or snowshoeing on nature hikes to see and learn about animal tracks. At night there is a dance, karaoke and bingo. Biathlon is now on target at many XC ski areas across the country. The sport of biathlon combines cross country (XC) skiing and target shooting. The roots of biathlon are traced to Scandinavia in the mid 1700's, and currently in Europe it is the most popular winter sport attracting 700 million annual television viewers. XC ski areas in the US are now offering programs with real 22 caliber biathlon rifles, laser rifles, and even paintball markers (guns). Biathletes race 5 kilometers (3 miles) on XC skis before shooting a rifle at five targets 50 meters (164 feet or 54 yards) away. They have a pounding heart and shaking legs with cold fingers and must take five shots. It may be cold and snowy while the sport entails concentration for precision rifle marksmanship. The competition includes shooting from a standing position and a prone (lying down) position. Depending upon the venue, the penalty for a missed shot may be a one minute added on the competitor's time or skiing a penalty lap. The Olympic Sports Complex in Lake Placid, NY has scheduled biathlon lessons on selected dates December-March, with experienced instructors where skiers can head out to the range under careful supervision. The "Be a Biathlete" program is on the actual shooting range used by Olympic athletes in the 1998 Olympics held in Lake Placid. The "Discover Biathlon" program and package for $55 includes a one-hour ski lesson and use of a rifle at the biathlon shooting range. Skiers can pay $16 for a shooting only one-hour session where they are informed about safety before they go to the range. In a similar program at Soldier Hollow Cross Country Ski Resort in Midway, UT you will be provided with ten clips of five shots each, for plenty of opportunity to learn and improve. The highly accurate rifles are the very same rifles used during the Olympic Games held in Utah in 2002. After range instruction and practice, a "mini' fun competition is staged for participants. Programs are coordinated by reservation for minimum of two people, who can ski or snowshoe and there are three program levels. The Craftsbury Outdoors Center in Craftsbury, VT has recreational biathlon programs for adults and youth competition programs. A program in West VA at White Grass Touring Center is the BB Biathlon with scheduled activities on a day in Jan, Feb and March held at 1:00 PM where you ski and shoot 9 shots at 3 targets and everyone wins. Mountain Top Inn & Resort in Chittenden, VT initiated the Paintball Biathlon, which brings the aspects of biathlon to 250 kids in a one day event to ski and target shoot with paintball markers (guns). For the ski area, using paintball is a less expensive way to host biathlon. Skiers in paintball biathlon are rewarded with time deductions for each target they hit. Midway through each lap, the skiers visit the shooting range where identically sighted paintball markers (guns) await them to take their shots before skiing off for another lap. The event draws youngsters from across the region and is geared to have fun on snow. It has introduced the sport to kids and some of them are now participating more seriously in high school biathlon teams. There's another paintball biathlon called the Valentine's Day celebration in February at Gunstock Mountain Resort, NH. About a quarter of the cross country (XC) skiing population is older than 50 years old and as the large segment of population known as Baby Boomers continues to age, they are remaining active - many of them are looking for softer or easier forms of recreation and cross country skiing and snowshoeing fit that prescription. It is important for older people to exercise because it can help fight both physical and psychological maladies. Everyone understands the need to stay physically active and there is a growing body of research indicating that physical activity is beneficial for the brain, particularly the hippocampus, which is the part of the brain where working memory partially resides and is most susceptible to problems associated with aging. There is extensive evidence that outdoor exercise has positive impacts on sleep, depression, and anxiety. No matter how old you are, it just makes you feel good, too. The SeniorsSkiing.com 2015 Subscriber Survey showed that the priorities of the older skiers include: discounts; easy access to the area facility from the parking lot; newsletter or website pages dedicated to specific activities catering to older skiers; instruction or guide tailored to older skiers; and a meeting place or set-aside areas in the lodge for seniors. There are XC ski resorts and lodging establishments that have senior-friendly characteristics and the incentives almost always include discounts for older people. At Canmore Nordic Center in Canada, trail fee discounts begin at age 55, while most ski resorts set a higher age for lower-priced season or daily passes. At Bear Valley Nordic Center in CA, skiers aged 60-69 get a 28% discount on trail passes and those aged 70 and older get 60% off. At Tahoe Donner Cross Country in Truckee, CA the senior 4-week program is on Fridays at 11:30 AM for people age 60 and older to learn to ski in a fun, supportive environment. Skiers can select any of three sessions starting on Jan 6, Feb 3, and Mar 3. The program includes trail pass, rentals and instruction. At Lone Mountain Ranch in Big Sky, MT there is a discount for skiers aged 60-69 while it is free for those aged 70 or older to access the ski trails. They also apply a "senior" discount for season passes. This is a popular way that most ski areas attract the older skier segment. One of the age-old concepts is that many older skiers are retired and as such, they have more flexibility in their weekly schedule – also known as mid-week availability. During the week most cross country ski areas have few patrons, thus the development of group offers, activities, and programs such as at Lutsen Resort in MN where there is a Sunday-Thursday discount offer on lodging rates that includes free XC ski or snowshoe gear and a guide. The Cross Country Ski Headquarters in Roscommon, MI (and other XC ski areas in MI) has the Silver Streak Week (Monday-Friday on January 9-13, 2017) with complimentary facility access, free hot cocoa, and free demos. Programs such as Jackson Ski Touring's Friday Gliders & Easy Sliders and Tuesday Trekkers provide a group experience that's taken advantage of by mostly older folks. Such programs coordinate a scheduled weekly outing for groups such as the Easy Sliders, which is a group of skiers who cross country ski on easier trails (and they get tips from a guide) or the Tuesday Trekkers snowshoe group. For these examples, the Jackson Ski Touring Center in NH is the starting point and after the tour, people meet back at the lodge for an après ski spread with wine and cheese, fruit, coffee, and there's even a masseuse on hand to offer massage for tips. Garnet Hill Lodge in North River, NY hosts a weekly snowshoe club and Cross Country Ski Headquarters reports a similar group regularly drives two and half hours from Grand Rapids to visit and ski the area. At Lapland Lake Vacation Center in Northville, NY there's a Silver Strider discount trail pass and the weekly "Soup-er Seniors," which includes a free bowl of soup on non-holiday Thursdays starting in January. "Road Scholar" is a brand within the Elderhostel program intended for adults (many who are older) who want to travel, learn and stimulate discourse and friendship among other people for whom learning is the journey of a lifetime. The Craftsbury Outdoor Center hosts week-long Road Scholar XC ski programs during the winter months with programming inspired by the hostels and folk schools of Europe offering short term academic experiences to adults. This year Craftsbury Outdoor combines XC skiing and snowshoeing with other local programs. The folks taking advantage of cross country ski offers are proof that you're never too old to get out and enjoy nature in the winter. If you are an older skier or someone who would like to try cross country skiing or snowshoeing, check an XC ski resort near you for special programs. When it comes to cross country (XC) skiing, the theory of what goes up must come down may be going out of style. Nowadays many people really enjoy the fun of just going downhill on XC skis, but they'd prefer avoiding the need to laboriously trudge uphill to earn that fun. Yeah, the skis have waxless bases that allow you to ski uphill without totally killing yourself, but it's so much easier with the onset of "lift or shuttle-served" XC skiing. Simply put, lift or shuttle-served XC skiing allows the fun of the downhill with the use of a ski area lift or a shuttle ride so there's no need to "pay the price" of going miles uphill on skis. Of course, there are those who believe that one must earn such fun, but "no pain, no gain" may be a view that's, well a bit fuddyduddy. At Bretton Woods in New Hampshire's White Mountains there is a $31 High Country lift ticket that gets an XC skier up near the summit to the Mountain Road by way of a chair lift, for a 7 kilometer (km) ski back down. The trail is easy enough and skiers can ski in the groomed tracks or on the flat skate lane, where they can make turns or snowplow. The Bretton Woods lift ticket provides one ride on the high speed detachable quad (which slows down upon egress) and unlimited use of a T-bar, which is a few kilometers down the trail. The T-bar provides access to upper elevations of Mount Stickney and the Stickney Cabin, which has snacks, beverages and a place to hang out with indoor seating or outside by a stone fireplace. Skiing back to the Mountain Road offers some choices including a groomed trail or skiing through the glades (trees) with options for different levels of difficulty. The Mountain Road is one of the most fun trails to be had on XC skis in New England! In the northwest at 49 Degrees North Mountain Resort there is a lift-served XC ski trail called the Summit Trail that is accessed near the top of Chewelah Peak. It descends and winds around the mountain for 12 km. On a clear day one can see all the way to Montana from the trail and many animal tracks or an occasional moose might be seen. It is a 2,000 foot decline in elevation but not all downhill though. Other XC ski trails that are accessed by chair lifts can be found at Giants Ridge in MN with a free lift ride when you purchase a trail pass to access the 6 km Bronze Trail, the 6 km Summit Trail, or the 14 km Gold Trail. Boyne Mountain in MI has the Cold Springs Downhill trail. Royal Gorge in the Tahoe, CA area has two surface ski lifts for practicing downhill turns and also having accelerated fun. At Garnet Hill Lodge, in North River, NY there's a shuttle ride from the bottom of a long downhill back to the lodge that has been offered since the early eighties. It originated when the lodge owner picked up skiers in his car and was then upgraded to a van and now it's a mini-bus. The shuttle is a free service for the skiers at Garnet Hill Lodge. Skiers must sign up for the shuttle and there are many routes that skiers can take using intermediate rated trails to reach the two pick-up locations that have a 500 foot and 900 foot vertical drop, respectively. Shuttles are offered daily and 3-5 times a day on weekends and holidays. During the week and on slow times, the shuttle is offered on demand. The Great Glen Trails Outdoor Center in Gorham, NH is adjacent to the Mt. Washington Auto Road and offers an uphill ride to achieve "treeline status" in the SnowCoach, which is a tracked van. The comfortable heated tour takes folks to the 4,000 foot elevation up Mount Washington where the views are breathtaking. Intermediate and advanced skiers can handle skiing down this road as a thrilling four mile decent back to the base lodge. There are various price options for the SnowCoach. Craftsbury Outdoor Center in Vermont has a free shuttle on the weekends that delivers skiers to the Highland Lodge for a 20 km return trek. There's a net drop of about 300 meters on the groomed trail, which traverses hill top pastures, farmsteads, and quaint Vermont villages. A shorter 5 km shuttled ride brings skiers back to the lodge from Craftsbury Village at the general store and deli. At Lone Mountain Ranch in Big Sky, MT there is the Upper Trail Shuttle (available a few times per week) that takes you a couple of miles away from the facility and leaves you with a mostly downhill ski back to the lodge for about 10 km. One might wonder that if the downhill ski run is the objective, why not simply go alpine skiing? The trails above are cross country ski experiences. They all require kick and glide techniques across some flat terrain and they do not have the consistent and necessary steepness for alpine skiing. As lift and shuttle services become more popular, they'll be available at more ski areas but until that happens, you'll have to seek out areas that offer this service if you want this level of fun on XC skis. For people interested in traveling to xc ski resorts this winter, here is info about making a destination selection from the editor of XCSkiResorts.com. In general, xc skiers select their winter xc ski destination resorts using some rating system of how xc ski areas perform in eight categories of criteria including trail quality and grooming, scenery, food quality, staff friendliness and service, the ski lodge facility and family issues. There is a great range of xc ski areas in North America and in the eyes of xc skiers these characteristics delineate areas without concern to whether the area is an inn, a ranch, a day area, a destination resort, or a recreation park area. I've purposely avoided the issue of cost - whether you like to travel to distant resorts or only travel within your region, you will still compare the other criteria to select your destination resort. The information below describes what a quality xc ski resort is all about in terms of services and amenities at some of the leading xc ski resorts in North America. Trail Quality relates to the skiers' comfort on the trails, even though those skiers might be at different skiing or experience levels. The trail signage should help skiers understand where they are on the area's trail network. And signs should help skiers know the direction that will help them return to their starting place. The trails should provide a skiing flow so there aren't too many long uphills or sharp turns at the bottom of steep downhills. One idea that is done at Lapland Lake in Northville, New York that makes trails seem less crowded is to have skiers go in the same direction (one-way). The result is that the trails never seem crowded. Jim Richards of Maplelag in Calloway, Minnesota said, "Feedback from the majority of our skiers let us know that they preferred double-tracked trails over single tracks. And we had overwhelmingly negative opinions about allowing dogs on the trails, too." Some of the best xc ski areas are just blessed with great terrain for xc skiing. The location of Royal Gorge in Soda Springs, California is perfect for xc skiing as the area's land diversity offers flat, rolling and more challenging variety. And Royal Gorge's "Sierra maritime snow consolidates well and is great for the base on the trails, which means that skiers can count on excellent conditions when they ski there." Trail grooming can make or break the ski conditions. Olavi Hirvonen former owner of Lapland Lake states, "We groom every morning unless we have to wait for the snow to dry out or cool off - and I groom the way I like to ski the trails myself." Hirvonen gets the Lapland Lake staff out on the trails after windy periods to rake and pick up the debris from trees like fallen limbs and pinecones because "I don't want the skiers to have to ski over the debris as it appears on the trails from the Springtime melt." One thing that most of the best xc ski areas share in common is that they acquire and use the latest trail grooming technology to give them a mechanical advantage. They do not skimp when it comes to using snowcats with their grooming attachments to break up ice or powderize the snow into the finest trail surfaces. Without getting into the details of grooming machinery and techniques, the personal pride of the area operators is paramount to the trail quality issue. Brian Wadsworth formerly of Lone Mountain Ranch in Big Sky, Montana was a world class cross country ski racer, who groomed trails for eight years at the Ranch. He was selected by the Soldiers Hollow Olympic venue to groom the 2002 Olympic Cross Country Ski competition trails. He knows grooming from a technical and a skier's perspective. He knows the "best line tracks." But when he comments, "My goal is to be able to hold a World Cup race here any day of the winter" it sums up his pride and commitment to the quality of the trails at Lone Mountain Ranch. You know it when an area's staff is a great one - they seem happy to see you. In most instances, areas that have veteran employees have them because it is a great place to work. Most of these great employees do not need "customer service" training. They already have the personal touch. At Lone Mountain Ranch the staff has become "the hallmark in the industry," according to Wadsworth because they are "encouraged to create life-long relationships with the guests." Most of the people that work at the best xc ski areas want to work there as a lifestyle choice. This is apparent with their attitudes with the guests and about working at one of the best xc ski areas. The Richards family, who own and run the Maplelag Resort in Callaway, Minnesota, treat their guests as part of their family. It may sound trite but their guests sincerely feel welcome and they state it unequivocally in testimonials. The staff often greets the guests by name. The Richards constantly ask their guests if there is anything that can be done and they drop everything to help their guests, be it in the lodge, on the trails, in the rental shop or at the dinner table. Richards feels, "One of us (the Richards family) is always around to help with our guests. It's fun to be talked to and pampered by the actual owners of the resort." Many testimonials from different areas claim the same thing with regard to their feelings about the service at the best resorts - they feel welcome, comfortable and "at home." And Maplelag avoids posting rules or signs saying "Don't do this or that." XC ski lodges can be designed to provide space, convenience and efficient utilization, but there are also other factors that make a difference to skiers. Ann Hirvonen former owner of Lapland Lake states, "Clean is huge to us. We are cozy and convenient, but facilities such as restrooms can get pretty yucky, so we keep them in good condition throughout the day." Lapland also takes into account brown baggers (bring their own lunch rather than purchase food at the area) by offering them a picnic area. And they have a public shower and changing area for skiers, who want to clean up before their drive home. At Lone Mountain Ranch, part of their ambiance is the historic facilities. Of course they have also added new updated facilities such as a dining room and some cabins, but many guests go there to enjoy the rustic and original facilities. "It looks like what people expect Montana to look like and we continue to renovate with cozy features such as antique furniture and old fashioned quilts to retain our historical aspects," said Wadsworth. The main lodge at Maplelag is the area's group meeting place, and it is a living folk art museum. Jim Richards has collected unusual items from around the world. He stated, "We work very hard cultivating this look to be a feast for the eyes." There are nooks and crannies where people can sit and relax, read a book, play games with the family, etc. The lodge also houses the main dining room, hot tub, sauna, massage rooms, rental shop, gift store and it is where the Saturday night talent show and dance takes place. Whether Nordic skiers bring a picnic lunch, stop at a trailside snack shack or relax with a first class dining experience, the best areas usually are known for their outstanding cuisine. Good food service is a result of the area's commitment, quality chefs with pedigree culinary backgrounds, wine selection, and so on. The Maplelag kitchen is run by Debbie, the chef who has been on the job on and off for 25 years. There is a window opening to the kitchen where guests can speak with Debbie and see the staff cooking the meals. They make everything from scratch using only natural and fresh ingredients. They call it homestyle, hearty, and wholesome and it is a unique menu that is endorsed by the guests. Richards' summarized, "Food is a real joy at Maplelag. Some xc ski areas are highly touted for their commitment to families. They cater to family needs by "dealing with the kids." Ann Hirvonen of Lapland Lake says, "We are a family and we raised our daughter here and when you raise a family at a ski center, you focus on families. So our trails have plenty of flat terrain for kids and we offer pulks (sleds that skiers use to carry small children), children's sized snowshoes, skis, boots, and ice skates." 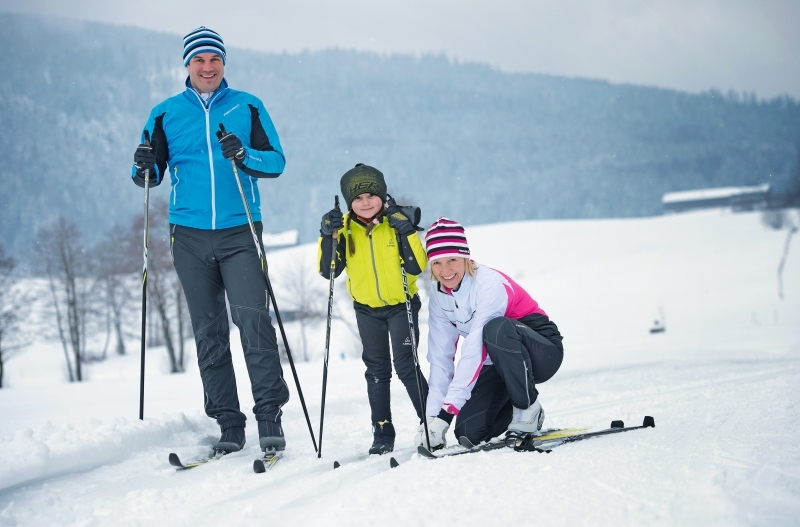 XC skiing offers families an activity that they can all do together. And that can include a four-year old on Snoopy skis skiing right alongside of grandpa skiing on his pine tarred woody originals. Child-oriented instructors are a key element for families. For the kids to have a positive attitude about Nordic skiing they must have positive first experiences. It is suggested that the most successful lessons do not intermingle children with their parents in the same classes. Kids get comfortable with child-friendly instructors as individuals and on subsequent visits the kids commonly request to take additional lessons so they can spend more time with those friendly instructors. Another important way to cater to families is to offer a variety of other skiing and non-skiing activities. At Lapland Lake a game played in Finland called Napa Kiikku is organized on weekends and holidays. The game involves a pole on ice with a sled that goes around in a circle. Adult lessons are conducted to correlate to the time that the kids play the game. Kids love a campfire by the lake, sleigh rides, or just playing on a big pile of snow. Trapp Family Lodge in Stowe, Vermont conducts many kids "classes" from swimming to puppet classes or making stuffed animals. The kids' classes provide parents with some child-free time for going on harder ski trails or getting a massage while the kids are being entertained. Jay Richards (Jim and Mary Richards' son) of Maplelag commented, "Seeing our large family with our own kids running around, being involved makes families feel welcome here. We try to make parents feel at ease about having their kids run around." Maplelag cabins and cabooses are great accommodations that can fit large families and the Richards try to help families focus on being together doing family activities. Serving meals "family style" is a key element to the atmosphere. But so are the other family activities such as the dance and the talent show. Baby sitting services are available on site, too. Jay feels that one of the biggest reasons families visit is that there are many families already at Maplelag every time people visit and that makes families feel welcome. Of course, there are other criteria for selecting winter destinations - for example, couples that are looking for a romantic weekend will have different needs (and desires). There is something more memorable about traveling to a destination compared to going to the local trail network for a couple of hours to xc ski or snowshoe. Whatever your interests, there is a perfect xc ski resort for you. The biggest disparity between going cross country (XC) skiing on your own through the woods and XC skiing at a commercial XC ski area is trail conditions. Trail grooming at commercial XC ski areas (that charge a trail fee) refers to using a vehicle with attachments to rework the snow to provide consistent ski and trail conditions. A compacted trail surface with set tracks will help skis to glide forward with minimal energy loss so that skiing is easier, beginners can learn to ski under control more quickly, and skiers can go further more efficiently. Icy trail conditions can be renovated and made skiable, and trails with little snow can be made skiable and last longer. Other important grooming situations include packing new snow to decrease wind susceptibility and conditioning deeper snow pack on high traffic trails, instruction areas, and down hills. According to the "Cross Country USA Ski Area Development Manual" by Nordic Group International, "Good trail grooming is somewhere between a craft and an art," but the most prevalent factors to grooming the XC ski area trails include the snow conditions, temperature, humidity and exposure, the type and size of vehicle and attachments, and operator skills. Chris Meyers of Bohart Ranch in Bozeman, MT spoke with XCSkiResorts.com about his 26 years of trail grooming commenting, "For the skier, you want it to be easy to ski and you don't want it icy." He goes out before sunrise when the humidity is lowest and it is coldest for his grooming to get better compaction of the snow. Also, there're no skiers on the trails at that time. As the sun comes out, the trails set up. In general, ski trail groomers use a snowmobile or a large snowcat and each has its benefits and detriments. To the ski area operator, the significant issues include the cost of acquiring the grooming vehicle, the cost of fueling and maintaining the vehicle, depreciation, and finding a reliable skilled groomer (operator). "Snocats" are big tractors with treads, which employ front and rear attachments (such as snowblade, tiller, powdermaker, compactor, or tracksetter) to rework the snow. Doug Edgerton of Yellowstone Track Systems and distributor of the Ginsu Groomer shared information with XCSkiResorts.com about the cost of trail grooming saying, "The big vehicles can cost $200,000 for a new one, but many ski area operators purchase used grooming vehicles and attachments. Running a large vehicle could cost in the range of $75-100 per hour. Gasoline alone can be about $25 per hour. Smaller snowmobiles with attachments that are used for trail grooming can cost between $12-14,000." Snow farming is used by many ski area operators to retain snow, create cache sites in drift areas and shovel snow for later redistribution. Wet areas can be covered in hay bales or hay over plywood to hold the snow. Snow fencing can be mounted on skis and towed to different trails to catch the snow during snowstorms. Front blades on a snocat are used to move snow around and borrow it from trail edges or caches. Tillers are used to break up ice, crust, and ski-compacted snow. Snow rollers can pack the snow to prevent it from blowing away or melting too quickly. Of course, more areas are now investing in snowmaking to produce machine-made snow that has to be moved and conditioned on the trails. The Jackson Ski Touring Center recently upgraded their fleet of snow grooming tractors with the addition of a brand new $175,000 state-of-the-art Kassborher PB 100 grooming vehicle, which was added a new grooming implement to supplement their early season grooming fleet. The new PB 100 grooming vehicle incorporates the latest in grooming technology and Jackson's former Executive Director Thom Perkins said, "Over the years, we've spent hundreds of thousands of dollars preparing the surface of the trails to be able to groom with the first snow of the season. Skiers can be assured that with this new equipment, our crew will be able to provide even better skiing." All in all, we have the trail groomers to thank for XC ski trails that are consistent, safe, and fun to ski. Photos: Maplelag Resort, MN (Top) Snocat trail groomer and (lower) snowmobile with rolling compactor. Not everyone who visits a ski resort wants to or is able to ski or snowboard, so resorts offer other activities. Among those options, guests can explore and enjoy the outdoors on snowshoes. These snowshoe outings at ski resorts range from guided naturalist tours to nearby destinations to athletic fitness treks reaching the top of the mountain. Snowshoeing options at ski resorts are booming and becoming ever more creative. Smuggler's Notch Resort known as a prime Vermont family destination has one of the most comprehensive mixes of snowshoe programs available. There are snowshoe treks for families with young kids, and outings for adults or families with older kids, who want a bit more in terms of the length of the trek, the topography covered, and the insights shared about the natural world and outdoor skills. Programs are scheduled for specific days and times at different prices for adult and children. Special family snowshoe programs that are easy include the S'mores Snowshoe Tour, which is a guided snowshoe trek on Wednesday's 6-7:30 PM through the woods to a rustic pavilion and bonfire. The Sugar On Snow Snowshoe Trek is where you learn a bit about the history and process of Maple Sugaring. Upon your return to Smuggler's Nordic Center, enjoy a sweet treat of Sugar on Snow, a Vermont tradition. On Tuesday evenings, Smuggler's Notch hosts a dramatic dining feature atop Sterling Mountain for adults, who ride the Sterling lift to a mountain cabin lit only by candles. There's a gourmet meal served with appetizer, salad, choice of main course, and dessert. After dinner, those calories can be burned off with a 40-minute snowshoe down to the Base Lodge. Beaver Creek Resort in Avon, CO has a variety of snowshoe tours via the Strawberry Park Express chair lift. There are guided naturalist snowshoe tours for two hours that include the gear and a map at $175 for two people. The group tours are $73 per person. On certain days the 3-hour Fit Tour is available and there's also the Wine Excursion Snowshoe Tour. On Fridays, there's the Fondue & Snowshoe Tour and on Wednesdays the Women's Walk and Wine is offered. The Family Tour is 4-5:30 with a guide, hot cocoa and snacks. The private guided snowshoe tours include the two-hour outing at $285, the half day at $395, and the All Day Snowshoe Tour is $600. Following each tour, the Osprey Fireside Grill welcomes guests into its slope-side, mountain-modern elegance – where Executive Chef Conor Shedor presents decedent culinary and wine pairings befitting of a post-snowshoe hike. At Crystal Mountain in Thompsonville, MI, there are daily guided snowshoe tours and evening moonlight snowshoe tours. One of the popular treks is to the Michigan Legacy Art Park, which is a 30-acre preserve on 1.6 miles of hiking trails within Crystal Mountain. The Art Park features 45 sculptures (20 in the winter), poetry stones, an outdoor amphitheatre (open in the summer). Stop by the Base Camp at Big Sky Resort in Montana for snowshoe adventures. They have a 2-hour snowshoe tour on the Moose Tracks Trail for up to 10 people at a time led by two local women guides. There are designated trails for snowshoers to go out on their own, but they are asked to pay a $5 trail pass. Click for the resort website video about the guided snowshoe tours that are available at $50 for guests aged 12 or older at Big Sky Resort . Back in Vermont, a resort that presents a different option is Mount Snow where snowshoe tours are available via the Grand Summit Hotel lodge's NatureSpa. There are planned and marked trail routes at the ski area and the unique "Guided Snowshoe Tour & Massage," that includes (for $185) a guided snowshoe tour followed by a sorely kneaded massage after returning to the spa. Trail loops can take an hour or two and snowshoes are available to rent. Click for a link to the NatureSpa. Guided snowshoe tours take about an hour for $45 per person including the snowshoes, poles and a group guide. There are also private tours available and outings offered to people who are more athletic and looking for a fitness workout on snowshoes or an environmental tour with a local Vermonter talking about animal tracks or local geography. Trail maps for snowshoers are available at Mount Snow Sports, where snowshoe rental equipment and a trail pass can be acquired. The trail pass is $10 per day and rentals are $25 per day or $15 per afternoon. It was necessary this year for some of the Smuggler's Notch snowshoe treks to be on the alpine slopes due to low snow in the valley. Snowshoers used the lifts to access a high elevation tour and a backcountry tour. The Smuggler's Nordic Director commented, "When the skiers saw the people snowshoeing on the slopesides, they wanted to get out of their skis to come and try it." A recent visit to Bolton Valley Nordic Center in Vermont afforded me an up close look at the newest sensation in cross country skiing – backcountry access at a commercial xc ski area. Bolton boasts having 62 km of high elevation backcountry ski trails including steep winding trails through birch glades, mellow trails for touring, and plenty of powder turns on the way back down. In mid-February while much of New England was wondering when winter would begin, Bolton Valley Nordic Center with its base elevation of 2,100 feet has fresh snow and a reliable, plentiful base. The facility has 26 km of groomed trails, too. The rental equipment includes backcountry gear for either xc skiing or snowshoeing. The famous Catamount Trail is amidst Bolton’s trail system and there seems to be no limit to interest in this market segment. In fact, the grand daddy of xc ski areas, Trapp Family Lodge now offers 2,500 acres and 40 km of trails in the backcountry, too. At Bolton Valley Nordic Center's eastern side, the Bryant Ski Trail takes skiers uphill on an hour trek to the Bryant Camp Backcountry Cabin (2,690 foot elevation). Not much to the building but it is a destination that opens into various trails further up the terrain. By the time I arrived in the late morning the trails were packed by previous skiers. I had a few chats with other skiers, who donned gear ranging from lightweight xc skis to heavy telemark gear with climbing skins, wide waxless skis with BC boot/bindings, and I even dodged a snowboarder careening down the packed trail on a split decision snowboard. I had a conversation with a couple of skiers, who admitted to taking the Wilderness Lift at the adjacent Bolton Valley alpine ski area to ski from the Peggy Dow’s Trail to the Nordic area’s backcountry terrain and the Heavenly Highway Trail where I met them. I skied further up the Highway and then turned on to an aptly named trail called Devil’s Drop, which was really a downhill powder run with switchbacks. Clearly, you want to ski these trails on a day with good soft snow conditions. The trails are well marked and with skiers dropping down into untracked lines through the trees the upper trails can be a bit confusing. It appeared that after skiing around a few times it would be more comforting as one becomes familiar with the upper trails. There is an overlook named Stowe View and another trail where you can reach a destination named Olga’s Falls. The Bolton-Trapp Trail uses the Catamount Trail (Vermont’s lengthwise winter trail) between the Bolton Valley Nordic Center and Trapp Family Lodge in Stowe and this reaches the highest point on the Catamount Trail at 3,310 foot elevation. The west side of the Bolton trails covers another entire area to ski and looking at the map contours it is appealing for some downhill fun. The backcountry area also has some delineated glade areas on the trail map and one would imagine that there could be much more of these cleaned areas to give skiers more to enjoy. Trapp Family Lodge offers guided tours in the backcountry for $35 hour and there is a 3-day package with rental equipment, skill lessons, and a full day tour for $250. Bolton has backcountry rental gear for $30. About a decade ago, alpine ski resorts came to the realization that gladed areas (skiing in the trees rather than on the groomed slopes) between trails offers great fun to skiers. They have created safe glades on gentle terrain by eliminating underbrush, smaller trees, and rocks so there is more room for skiers to pick their way through the forest (somewhat) safely. Glade areas for advanced skiers offer steeper terrain and more obstacles. Call me a heretic, but I feel that the time has come for xc ski area operators to accept that there are many skiers who would like to access these backcountry stashes without having to climb and get so tired. Clearly there is a portion of the skiing population who would pay for transport up to higher elevations to access these areas so they can enjoy the downhill runs. For a few extra dollars above the trail pass, such transport could be provided with an industrial snowmobile (which most resorts already use) pulling an attached trailer with seats. And maybe the snowmobile driver can stop at the top to take some photos of the skiers as they take off down the terrain. Skiers can purchase the photo documentation back at the lodge and get the photos emailed to their computer or phone so they can show their weekend adventure to coworkers on Monday morning at work. I imagine that xc ski resort operators might feel that such a service is the domain of alpine ski resorts...but xc ski areas could offer a more natural service within the context of xc skiing and snowshoeing. People like high places and the product supplier companies have recently produced a proliferation of off-track and backcountry equipment. This type of xc ski resort service has arrived.